On this date in 1733, a rebellious slave named Julian the Indian was hanged for murdering a bounty hunter who pursued his escape. Julian the Indian is generally believed to be John Julian (or Julien), a mixed-race African-descended Mosquito Indian from central America who was among the crew of the egalitarian pirate Samuel Bellamy. Julian appears to be the first recorded black pirate in the New World. Julian was one of only two pirates who survived the wreck of Bellamy’s Whydah off Cape Cod in 1717 (Bellamy himself was lost in the incident), and was jailed in Massachusetts. There, he apparently becomes the “Julian the Indian” purchased that same year by colonial pol John Quincy. The “unruly” Julian gave his owner no end of escape attempts and was sold on to another owner, from whom he made one escape attempt too many. 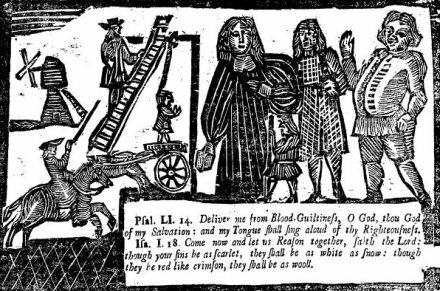 There’s a gallows pamphlet, “The last speech and dying advice of poor Julian: who was executed the 22d of March, 1733. for the murder of Mr. John Rogers of Pembroke,” but there’s no juicy buccaneer adventure in it, or even slave escape adventure — just a lot of generic pabulum about having forsaken God, not unlike the generic woodcut illustrating it. You’d have to say, a sad end for a multinational swashbuckler left over from the vanished Golden Age of Piracy who had seen things these New Englanders wouldn’t believe, and shattered his own life hurling it against his fetters. A noble soul, as we may reckon, destined to wind up meat for some wet-behind-the-ears colonial physician. It was common for the unclaimed bodies of executed prisoners to be given to medical students for dissection, and according to an article in The Boston Newsletter, on March 30, 1733 John’s corpse was used for this purpose. The article goes on to tell us that, “The Bones are preserv’d in order to be fram’d into a Skeleton”. This may be the source of the idea that the skeleton is in the collection of the Warren Anatomical Museum at Harvard Medical School in Cambridge, Massachusetts. Current research at the museum says this is untrue, and that neither the skeleton, nor the bag made from the skin of a pirate, also in the collection, are believed to belong to John Julian. John Quincy’s great-grandson, the American President John Quincy Adams, became a staunch slavery abolitionist.